It was raining when Eric Norman, Berkeley Lab physicist and University of California (UC) Berkeley professor of Nuclear Engineering, heard about the nuclear-reactor meltdown in Fukushima, Japan. "I immediately thought of Chernobyl," he says, referring to the "nuclear rain" that fell in the days that followed the 1986 disaster in Ukraine. Norman wanted to know if, following the March 11, 2011 Fukushima breach, radioactivity could be found in Bay Area precipitation. He and his students collected weeks' worth of rainwater around Berkeley Campus to find out. The results: low levels of a number of different radioactive nuclei produced by the fission of uranium-235 including, cesium-134, cesium-137, and iodine-131. (The number after the element represents the total number of protons and neutrons in the atom's nucleus.) "The levels we saw were detectable, but low and not a health hazard to anyone," Norman says. With findings in hand, he informed the local media that there was nothing to worry about, he says, and did his best to stress the lack of dangerous radioactivity in the rainwater. Fast-forward a couple years. 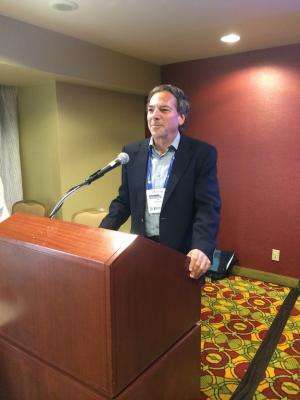 "I thought that was the end of it until I started seeing reports on the Internet and elsewhere," he explained at last month's 2014 meeting of the American Chemical Society in San Francisco, CA. People were again concerned about health hazards caused by the radiation. "I think part of the reason for that was there were reports of continuing leaks and releases of radioactivity—it wasn't just a one-time thing—and people began to think of the idea of radiation being transported across the Pacific, which of course will happen," Norman says. "I don't know where they got the numbers, but they were claiming very high numbers that were causing health effects on people especially children." Norman didn't immediately dismiss these new claims, but he couldn't find any up-to-date measurements of environmental radiation. So he decided to conduct his own study. In 2013, he and his students tested radiation levels in fish, plants, milk, seawater, and salt from a variety of locations throughout the Pacific Ocean and coastal regions. They compared the ratio of radioactive isotopes in the new samples to a sample Norman had collected years before: about a month after the Fukushima disaster, he noticed his backyard weeds had grown high from all the rain. Upon testing these weeds he found extremely low but detectable levels of cesium-134 and cesium-137, still well below limits for safety and health concerns. If any of the new samples contained these two isotopes in the same ratio as that of the weeds from 2011, it would indicate the presence of Fukushima radiation. With the help of Al Smith, physicist at Berkeley Lab and one of the world's experts on background gamma ray counting, and Keenan Thomas from UC Berkeley, the team analyzed and interpreted the results. They especially expected to find at least some cesium isotopes in the seaweed since it concentrates potassium, an element that's in the same column of cesium on the periodic table. "We looked very hard," Norman says. The scientists sampled their fish, seaweed, and other Pacific products from Hawaii, the Philippines, the West Coast areas, and Japan. But none of these samples showed any indication of radiation from Fukushima, Norman says. Why were radiation levels in these samples so low? "Many radioactive isotopes we saw in the rain water were very short lived," Norman explains. Iodine-131, for instance, has a half-life of just eight days. Additionally, dilution from ocean water plays a significant role. "We're a long way from Japan and there's a lot of water in the Pacific," he says. "Whatever gets dumped in the ocean will get diluted by enormous factors." Even so, Norman and his team continue to test samples so that they'll have up-to-date data to counter any scare claims of Fukushima radiation. Recently he's grown grapes in his yard and analyzed leaf samples. The isotope levels from his backyard flora, so low to begin with in 2011, have now completely faded away. A. Smith, K. Thomas, E. Norman, D. Hurley, B. Lo, Y. Chan, P. Guillaumon and B. Harvey, "Measurements of Fission Products from the Fukushima Daiichi Incident in San Francisco Bay Area Air Filters, Automobile Filters, Rainwater, and Food," Journal of Environmental Protection, Vol. 5 No. 3, 2014, pp. 207-221. DOI: 10.4236/jep.2014.53025. I suppose they are basing the title on the very last sentence in the article. Believe that the radiation is coming and it will show up in the water as it is already in the fish swimming in the West coast waters. TEPCO has lied to the people of Japan and to the world about the true levels of radiation released into the atmosphere, ground and into the Pacific Ocean! TEPCO also continues to dump millions of gallons of radioactive waste into the Pacific Ocean nonstop every single day to contaminate the fish, ocean life and animals. There is now verified proof of DNA damage and mutations throughout the food chain and we humans are next to suffer! Experts recommend to commence detoxing with the natural mineral called zeolite that is proven to safely remove both radiation and heavy metals from the human body.This MUST Be Done to help prevent DNA damage that will cause disease and future ongoing mutations! For more quality information do an online search for the single word Zeolite. The idea of delution dosnt work with radioactive elements. If you put 100 mil bq of strongium in a pool or pond or the ocean, you still have that 100mill bq strongium, Its just spreaded over a larger amount, it can not be dulited into a non dangerous element. As for looking for the radioactive elements in the ocean is all good and fine, but the radiation was here a week after the accident. If the water starts showing elevated levels of radiation, then pretty much the whole thing would be contaminated beyond use, an no good water is an extinction event. Crazy, nothing good about this fukushima. "The average radioactivity of seawater is about 14 Bq/L of which 88% is from naturally occurring potassium-40 (K-40). About 7% is from anthropogenic fallout from atmospheric nuclear weapons testing and nuclear accidents like Chernobyl (1986) and Fukushima Daiichi (2011)... Pre-Fukushima activities of Cs-137 were approximately 1 mBq/L in the NW Pacific and about 0.9 mBq/L in the NE Pacific off the coast of British Columbia where I live. That represents on the order of 0.007% of the radioactivity in a litre of seawater. Measurements of Cs-137 were made after the disaster at 50 stations 40-600km from the coast of Japan. At 40 km from the reactor site Cs-137 was elevated to up to 3500 times the background level or ~3.5 Bq/L (to 25% if the total naturally occurring background) and at 600 km Cs137 activity was 0.3 Bq/L (2% of natural radioactivity). Scientists did not have to take any precautions while handling seawater..."
-in case of aether spillage and contamination. this guy is lying. first there is no "safe" amount of radioactive particles that can be ingested into the body. even one single radioactive particle lodged in the body will cause cellular damage to the cells around it. people like this guy are spreading lies. here's the real whopper for ya .. there are ways to detox radiation particles from the body. did this guy tell you anything about how to remove radiation particles from your body ?? no... instead he told you there was nothing to worry about. "this guy is lying. first there is no "safe" amount of radioactive particles that can be ingested into the body." Right, and you can choke on food, you can trip down the stairs and break your neck, you might even get hit by a car walking on a sidewalk... yet most people would say eating food, and walking are considered safe. If you want to worry about people downcasting the term "safe" pay attention to when last year MIT said 200,000 Americans would die early as result of combustion of fossil fuels that year, or when WHO said 1 in 8 deaths on the planet would be caused by the same factors of a somewhat narrow range of carbon particulate matter sizes and ozone as result of combustion of fossil fuels. Guess what if we did not provide 20% of our electricity with nukes about 40,000 people more would die every year. Fukushima even though a disaster is still safe compared to what is considered safe and legal right here, right now. Heavy elements do not good swimmers make. Check the bottom of the Izu-Sugami trench. First one would have to invent the technology to do that. The old idea of disposal of nuclear waste in subduction zones is being revisited, this time by purely natural forces. Real time monitoring of Fukushima is available, limited to shallow coastal waters. There is a very steep increase in depth just off the coast. Creating panic is an age-old fundraising technique. If you are genuinely in fear of radiation, you should learn about "...the most cynical experiment ever carried out in biology..."